The place of Jews is notoriously controversial in Nietzsche’s body of work. Ever since his sister Elisabeth took charge of editing his manuscripts, there has been considerable disagreement on the extent of her own anti-Semitism imported to Nietzsche’s writing. The fact remains, however, that Nietzsche wrote of the Jews much earlier than his collapse in Turin – and indeed that [amazon asin=0521016886&text=The Antichrist] and [amazon asin=052169163X&text=Towards the Genealogy of Morality] manuscripts were largely finalised and underwent relatively few edits (though, of course, some edits were significant). And yet, while Nietzsche remained uncertain of his views, the expressions about Jews did appear in his work. This is of course not to say that Nietzsche was unclear – quite the contrary. What I mean by uncertain is precisely in the lack of certain conclusions to be drawn, or specific actions to be taken regarding the Jewish question. In what follows, I aim to show why this uncertainty regarding the Jewish question is fundamental in understanding Nietzsche as an ‘anti-anti-Semite’. Doing so will help us to counter the accusations of anti-Semitism without resort to biographical episodes – largely found in his letters to friends and family. Instead, it should be possible to counter the arguments from his work – i.e. philosophically. The history of mankind would be far too stupid a thing if it had not had the intellect [Geist] of the powerless injected into it: – let us take the best example straight away. Nothing that has been done on earth against ‘the noble’, ‘the mighty’, ‘the masters’ and ‘the rulers’, is worth mentioning compared with what the Jews have done against them: the Jews, that priestly people, which in the last resort was able to gain satisfaction from its enemies and conquerors only through a radical revaluation of their values, that is, through an act of the most deliberate revenge [durch einen Akt der geistigsten Rache]. Only this was fitting for a priestly people with the most entrenched priestly vengefulness. It was the Jews who, rejecting the aristocratic value equation (good = noble = powerful = beautiful = happy = blessed) ventured, with awe-inspiring consistency, to bring about a reversal and held it in the teeth of the most unfathomable hatred (the hatred of the powerless), saying: ‘Only those who suffer are good, only the poor, the powerless, the lowly are good; the suffering, the deprived, the sick, the ugly, are the only pious people, the only ones saved, salvation is for them alone, whereas you rich, the noble and powerful, you are eternally wicked, cruel, lustful, insatiate, godless, you will also be eternally wretched, cursed and damned!’ . . . the slaves’ revolt in morality begins with the Jews: a revolt which has two thousand years of history behind it and which has only been lost sight of because – it was victorious . . . ([amazon asin=052169163X&text=Towards the Genealogy of Morality], §I.7). Anti-Semitism has at its core a priestly attitude – but what does that mean? Nietzsche argues here that there is a continuity to be found between the tradition of opposing the masters and the contemporary slavish nature of blind following of popular positions (security through state, anti-Semitism, etc.) – the powerless in the first sentence are thus to be taken seriously, those who could not protect themselves. 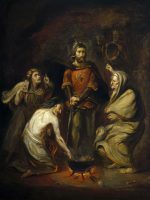 This continuity between the Jewish tradition and contemporary slavish nature is what he terms priestly Judaism – it is structured around fear and ressentiment. Priestly Judaism requires the other for negation, its own position is only that of negation of the other. As irony would have it, the anti-Semitic attitude thus incorporates the very thing it aims to negate – namely, the priestly Judaic tradition. Instead of affirmation of life, the anti-Semite negates the other as a precondition of their being. One of the greatest stupidities you have committed—for yourself and for me! Your association with an anti-Semitic chief expresses a foreignness to my whole way of life which fills me ever again with ire or melancholy. . . . It is a matter of honor to me to be absolutely clean and unequivocal regarding anti-Semitism, namely opposed, as I am in my writings. I have been persecuted in recent times with letters and Anti-Semitic Correspondence3 sheets; my disgust with the party (which would like all too well the advantage of my name!) is as outspoken as possible, but the relation to Förster, as well as the after-effect of my former anti-Semitic publisher Schmeitzner, always brings the adherents of this disagreeable party back to the idea that I must after all belong to them. . . . Above all it arouses mistrust against my character, as if I publicly condemned something which I favoured secretly—and that I am unable to do anything against it, that in every Anti-Semitic Correspondence sheet the name Zarathustra is used has already made me sick several times (as quoted in Kaufmann, [amazon asin=0691160260&text=Nietzsche: Philosopher, Psychologist, Antichrist], p. 45). This accursed anti-Semitism . . . is the reason for the great rift between myself and my sister (as quoted in Yovel, [amazon asin=0415095131&text=Nietzsche and Jewish Culture] (edited by Jacob Golomb), p. 121). Please publish a list of German scholars, artists, poets, writers, actors, and virtuosi of Jewish extraction or intraction! That will be a valuable contribution to the history (and criticism!) of German culture (Yovel, [amazon asin=0520083180&text=Nietzsche, Genealogy, Morality: Essays on Nietzsche’s Genealogy of Morals] (edited by Richard Schacht), p. 220). The private letters are of course especially noteworthy because they establish the difficulty that it brings to his personal life, his close relation with his sister6, his alleged love for Cosima Wagner, his close friendship with Wagner himself prior to their falling apart, etc. Nietzsche did not want to be association with the anti-Semitic movement. He did not simply oppose it for the sake of opposition, or as something unconcerning to him; quite the opposite, these letters show how deeply anti-Semitism affected him on a personal level. Die Griechen sahen über sich die homerischen Götter nicht als Herren und sich unter ihnen nicht als Knechte, wie die Juden. Sie sahen gleichsam nur das Spiegelbild der gelungensten Exemplare ihrer eigenen Kaste, also ein Ideal, keinen Gegensatz des eigenen Wesens. Man fühlt sich mit einander verwandt, es besteht ein gegenseitiges Interesse, eine Art Symmachie. In fact, one could go as far as to say that the allegory of The Madman in Gay Science §125 is meant precisely at this end – the Christian god is dependent on the Judaic god; Christian anti-Semitism (and likewise the Islamic one) is thus at its very core a dubious endeavour. I will return to these briefly. Coincidentally, Nietzsche gives his Götzen-Dämmerung, ‘Der Hammer Redet’ as subtitle. Although so far you have demonstrated little faith in my ability to pay, I yet hope to demonstrate that I am somebody who pays his debts—for example, to you. I am just having all anti-Semites shot. 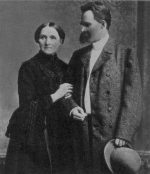 Despite academic dismissal of Elisabeth, it is very clear that Nietzsche loved his sister – despite her anti-Semitism.